A first singles gold ball was the reward for No. 4 seed Ann Li Sunday afternoon, as she survived a 90-minute rain delay prior to the start of the final and a spirited challenge from No. 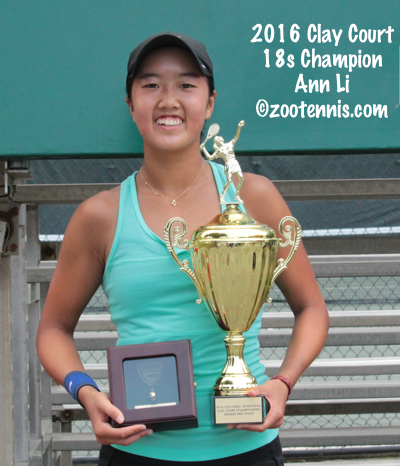 9 seed Amanda Meyer to claim a 6-4, 3-6, 6-4 victory at the USTA Girls 18s Clay Court Championships. Court 4, the show court at the Racquet Club of Memphis, needed extensive maintenance work for about an hour, but the skies cleared and the steamy temperatures that have been smothering the area all week reappeared by the second set of the final. Li, a 16-year-old from Devon, Pennsylvania, took the opening set by taking her first opportunity late in the set. With Meyer serving at 4-all 40-15, Li got the game to deuce, then came up with a nasty slice that stayed short and low, drawing an error from Meyer. On break point, her first since the first game of the match, Li hung on in a rally, with Meyer eventually sending a forehand long. Serving for the set, Li went up 40-15, but missed a backhand on her first set point. On the second, she got a chance to move forward and she put away a swinging forehand volley to take the lead. "I think in the first set, we were both not playing as well," said Li. "But I think I was kind of more solid than her. But in the second set, I was playing her game style more. I was hitting into her strike zone a lot, so it was easy for her to dictate off the points." Meyer was having more difficulty holding serve in the second set, but got an important hold in a four-deuce game at 3-3, then broke Li, who was up 30-0, by taking four straight points, including a backhand winner on game point. 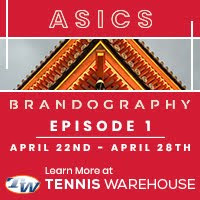 Meyer held, converting her first set point when Li missed a second serve return, executing the game planned she had formulated after the first set. "I just wanted to stay in there and take control of the point a little faster," said the 17-year-old from Delray Beach, Florida. "In the first set, I just gave her too many opportunities to pull me off the court and win the point. So in the second set, I just tried to focus on attacking first." After the 10-minute break between the second and third sets, Li came out with a much more aggressive mindset and quickly took a 2-0 lead. Meyer, who is usually very quiet on the court, berated herself for errors that came from being too energized. "In the third set I came out with a little too much adrenaline," Meyer said. "I hit the ball a little too hard, my mind was in overdrive. In the third game, I really focused on calming myself down and taking it point by point, staying in the moment." Li admitted she began to feel the effects of her two three-set matches on Saturday late in the second set. "In the ten minutes, I really tried to regroup and stay positive," said Li. "Because I was a little angry at the end. I tried to dictate more, because in the second, I was kind of falling behind. So I was really focusing on attacking her second serve and trying to keep my first serve percentage high and I think I did a good job of that." Li also said she talked herself out of feeling any fatigue in that break. ""I tried not to think of myself as tired, and when I came out, I didn't feel tired anymore. That energy really helped me." Li did give up her early break in the third game of the third set, but got another with Meyer serving at 2-3, denying three game points and converting on her first break point with a backhand that forced an error. Li had a point to go up 5-2 in her service game, but Meyer kept fighting, and got the break back to get to 4-3. "It was definitely disappointing, because I could have been up 5-2," Li said of that game. "But I think I did a good job of staying calm at that time, doing what I was doing before, and I think that worked." After two holds, Meyer was serving to stay in the match at 4-5, and Li really applied pressure on the first two points. Li's forehand volley winner and backhand on the baseline made it 0-30, and she had looks at second serves on the next two points. But Meyer made good deep second serves and won both points to make it 30-all. Meyer won the next point when Li made an unforced error on the backhand, but Meyer then netted a forehand to make it deuce. On the next point, Li put a ball deep into the backhand corner and Meyer couldn't get into position to return it, sending the backhand wide. She missed her first serve and the good second serve she had found earlier in the game wasn't there for a third time and she double faulted to give Li the title. "That was a relief," Li admitted of the double fault, knowing how every point had been so hard to earn in the late stages of the match. 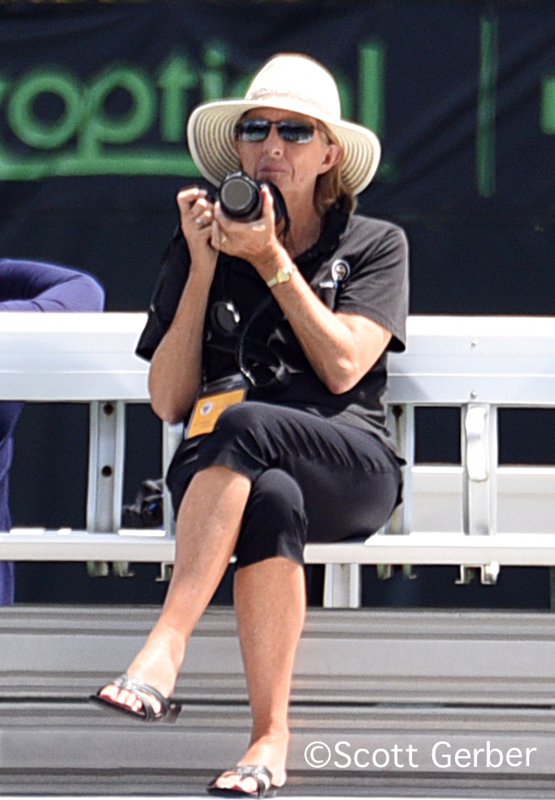 Although Meyer said she was disappointed to lose, she did manage to enjoy her first USTA Level 1 final. "I was able to savor almost all of the points," said Meyer, who had vowed she would do that after winning her semifinal match. "Except for maybe the double fault at the end. These are the types of matches that make me a better player, and I've got to keep that in mind. Not to be too upset--it's the finals--I went a long way to get here, and overall I'm very happy. I'll come out of this tournament a better player and person." Li is not one to show much emotion on the court, and with the way the match ended, an on-court celebration was not forthcoming. But she was all smiles at the trophy presentation and excited to have her first major USTA singles title. "It feels really good. Honestly, when I was sitting there, it kind of felt like I won a grand slam," Li said. "It felt really good. A lot of hard work, and all of it paid off." Li was unable to add a second gold ball in the doubles championship, with No. 2 seeds Elysia Bolton and Abigail Chiu picking up the title with a 6-2, 6-2 win over No. 3 seeds Li and Anna Brylin in the late afternoon final. Bolton, from New York, and Chiu, from Texas, had played together only once before, losing in an ITF Grade 4 final, but they now have eight gold balls in doubles between them. "We played really well today," said Bolton, who won the Easter Bowl Grade B1 ITF title in April with Chiara Lommer. "I think that's the best we've played all tournament." "I had a lot of fun this week," Chiu said. "This is my second time playing with Elysia, and I think our games complement each other well, and we've played really well throughout this tournament. I'm really happy to have won a gold ball in one of my last Super Nationals." "It was fun to play with her, because she's always really funny on the court," Bolton said. "I've played with some really great partners. Playing with Chiara at Easter Bowl and Abby here, I've had a lot of fun playing doubles recently." Chiu and Bolton will not be teaming up for the Nationals next month in San Diego, with Bolton already committed to playing with someone else when she was first approached by Chiu. The third-place bronze ball in doubles went to No. 1 seeds Lexi Milunovich and Anna Rogers, who beat Lommer and Victoria Flores, the No. 4 seeds, 7-5, 0-6, 6-3. The singles bronze ball was won by the unseeded Lommer, who defeated Isabella Lorenzini, a No. 9 seed, 6-2, 6-1 in the third place singles match. Bolton, a No. 9 seed, took fifth place, winning the consolation tournament with a 6-2, 6-4 decision over Nami Otsuka, a No. 17 seed. Bolton was also the recipient of the USTA Sportsmanship Award. For complete draws, see the Tennis Link site. At the girls 16s, No. 17 seed Alexa Noel made it two straight Clay titles. The 2015 champion in the girls 14s defeated No. 5 seed Amber O'Dell 1-6, 6-4, 6-3. At the boys 16s, No. 7 seed Lukas Greif took the title with a 6-1, 6-1 win over No. 14 seed Jenson Brooksby. Unseeded Sebastian Korda, son of former ATP player Petr Korda, took the boys 18s title, defeating No. 7 seed Alexandre Rotsaert 6-4, 6-1 in the final. 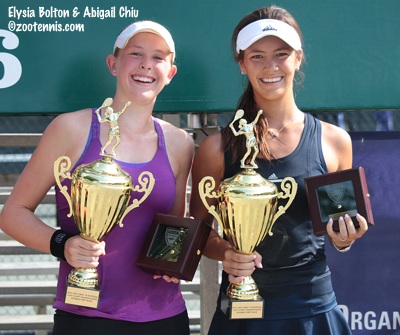 Both Korda and Li have earned wild cards into the main draw of the US Open Junior Championships with the title.